Once Upon a Learning Adventure: Project Binder-ize! A success! And some freebies for you! Today was my first day teaching in my new, Binder-ized classroom, and I have to say, I think I've got a little more pep in my step! Or, it could be that I know there are only 9 more weeks until summer, my baby girl took her first steps this week(holy cow! ), and the weather is gorgeous! So, I've been in a good mood despite the fact that today was the kind of Monday that is usually pretty tough due to everyone's post-break blues. As promised, I'm ready to share my photos and Freebies in case you are ready to add a little pep to your step as well! Curriculum files. Organized and alphabetized, but jam-packed! Also, not working for me! I have three big drawers like this. Okay, here is a picture of the process in action. I started with my Theme and Holiday files. I made a binder for each month and placed the binder, all files, and empty book boxes on student desks. Then, I sat on a rolling chair and wheeled my way around the table, recycling outdated materials (how can that be--I've only been teaching five years!?!) putting the keepers in sheet protecters in the binders and the related books in the book boxes. Easy, peasy! I repeated this process with my Curriculum Files on day two. As I put things in sheet protectors, I put temporary sticky note tabs on the pages to separate major topics. When I had everything in binders, I went back and added some fancy schmancy adhesive tabs to the sheet protectors so I'd be able to find items easily within the binders. These are alphabetized as I am apparently an alphabetical-type girl. I tried putting them in order of occurence throughout the month like my teammate suggested, but I started to freak out midway through and had to change them! Here are my binders all nice and neat (and, they take up much, much less space)! I decided to make my monthly binders blue and curriculum binders red to help my brain out a bit. Apparently, I'm a color-coding kind of girl, too! Here are the book boxes that correspond with each binder. All I did to make the labels was print the binder covers four per sheet, laminate them, and attach them to the book boxes, which were super-cheap from IKEA. I like how they match the binders and I'm excited to finally have all of my read-alouds in one place! No more getting lost in files or mixed up in student library baskets! Yay!! Now that I'm done with my curriculum and theme files, I'm ready to move on to my teacher and school-specific files... And maybe I'll find some other uses for binders, too! If you would like to Binder-ize your room, I will happily share my binder covers and spine inserts. I only ask that you leave me a little love if they are useful for you or share an organizing tip of your own(because a girl can never have too many organizing tips)! Click the pictures below to download them free from TPT! Happy organizing! P.S. By request, I have updated the binder covers and matching spine inserts to include the months June and July! 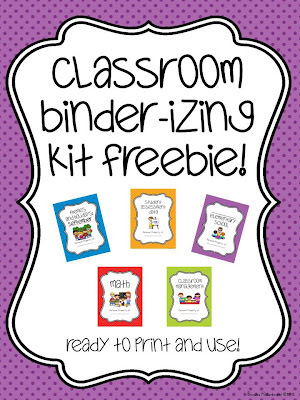 Ready to binder-ize your classroom, but want to personalize your binders with your own titles, graphics, name, fonts, and more? 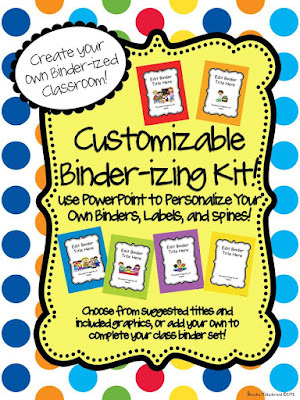 After many requests, you can now purchase a Customizable Binder-izing Kit! It includes over 36 color-coded binder covers and graphics that you can use with the suggested titles or your own personalized text. 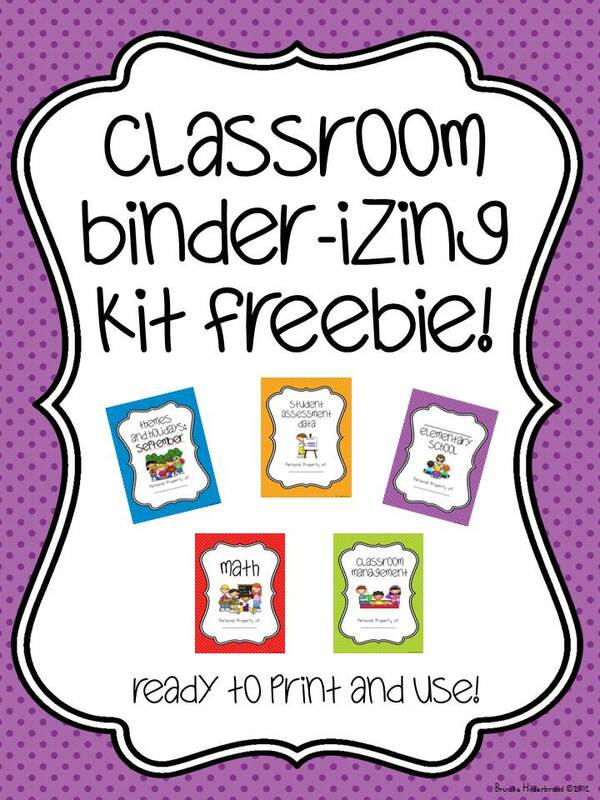 In addition, there are matching binder spines and blank binder covers that you can add your own text and graphics to in order to complete your class binder set! Personalizing your set is easy! All you do is open this file in Powerpoint 2010, select the textboxes that say "Edit Binder Title Here," and type in your own text! You can add your own images to the blank binder covers and even edit the font to your personal favorite! Click below to check it out at my TPT store! Love these! I want to binder-ize my files too! Summer goal...maybe? AMAZING! This looks unbelievable! I am on my way to binderize this summer and your post has given me inspiration :) I am your newest follower, too! Congrats on your little girl~ mine is a few months away from 1st steps, but I have a feeling it will be here before we know it! Thanks you so much. I've been keeping everything in binders by topic, but I think I like how you organized them. Love your binders! I am in the process of binderizing!! Thanks for inspiring!! I love this! It looks great. I am a new follower. Your blog is so cute! I would love for you to come check out my blog when you get the chance! Thanks, ladies! And good luck with your organizing, too! I know it took me a little while to work up the nerve to totally change my system, but so far, I'm loving it! I love binders (use them all the time) and your idea for organizing papers and themes is great. I'll be a first year teacher next year and think I'll have to invest in quite a few binders to organize my life. Wow - thanks so much. I purchased all my binders last weekend (to do this exact project) and they are sitting in my classroom waiting for me to make all of my covers and binder labels. Thanks so much for doing all the hard work for me. I will think of you as I look at all my pretty organized binders from now on. Thanks for sharing. I started moving my materials to binders earlier this year. Your cute covers are just what I needed. I will now be following your blog! Okay, I totally LOVE this! Now, what do you put in your curriculum binders versus your monthly and teacher binders? I am your newest follower :) Stop by and visit me when you get a chance. I just found your blog through Pinterest!! These look fantastic!! This is just the motivation I need to get organized, thanks! My curriculum binders have specific skills in them. For example, math has tabs for adding three numbers, time, money, basic addition, basic subtraction, story problems, etc. My theme/holiday binders have anything special for that month. Things like Johnny Appleseed in September, Spiders, Bats, Pumpkins, and Columbus Day in October. Basically any holidays or special events for the month. I pretty much just looked at what I already had files for grouped similar themes together. Hope that helps! Thank you for the binder covers! They are great and hopefully will inspire me to get even more organized this summer! Thanks, your room looks great. I put my stuff in accordion file folders. I found after being labeled the binder queen I was not so great at filing back. The accordion folders work better for me. I found your blog through Pinterest and I just love your binder covers. I've been trying to clean and organize too and these will really help. Thanks for sharing! I'm your newest follower! So I am in love with your organization! Thank you so so so much for sharing! This is definitely a summer goal for me! I'm in love and am a binder girl! I'm trying to think of a good tip to share. I moved classrooms last year and it just kind of got done if you know what I mean. Thank you so much for sharing!!! I can't wait to do my room! I have a small tip if you can use it.. but it comes with a worksheet that I created...where can I send it? This gives me hope. I kinda started something like this, but stopped part of the way through.You have given me the courage to purge and organize! Thank you!! love this idea! I'm not in a classroom right now but i feel this may help me organize my stuff at home! I cannot wait to use these in my classroom! I am a super organized teacher, but I'm always having a stack of things to be filed into my file cabinet. Hopefully this will help eliminate that stack! THANK YOU! These are so cool! My baby girl is leaving for college in a year and a half, so my advice is to treasure every single minute! Thanks for the sharing! Love your binders, my coworker and I are planning summer work and this will be so helpful!!! The other teachers on my 6th grade team call me the binder queen! I love binders so much more than files!!! I love the organization behind yours though. I need some more book shelves within my classroom though to make this work perfectly! WONDERFUL POST! I pin for TBA. I would love to pin this post but I can't pin something that links to a personal store! If you repost and upload those covers to something like Google Docs I would LOVE to pin it. I am sure this would be a popular pin that so many teachers would love. Let me know if you do this! Thank you for sharing this wonderful freebie and for inspiring me!!!! I love the classroom organization ideas. Love to be organized, but it is harder and harder to do by the end of the year. This is my summer project - to purge the outdated and never used, and organize what's left - what I really need. Thank you! Thank you for sharing! You are an angel. I see a summer project forming. Thanks for the great tools!! Love this post! I saw this at just the right time. I've been just standing and looking at my files (piles) and trying to figure out a better system! Thanks for sharing! Wow, I too have many file drawers filled with "stuff." I have a hard time discarding since I teach ELL and have to accommodate so many different grade levels. I love your system and would love to convert to a binder system. Thank you so much for sharing! I have very little storage and it would be great to make more room for the student's things rather than files! Is there any way I could get these e-mailed to me in a format other than PDF? I teach preschool and would like to label my binders with letters A-Z. If you can my e-mail is elizabeth.nuccio@gmail.com. If you can't I understand! WOW! I have been wanting to BINDERIZE for years. About 10 years ago, I observed a teacher who used Binders. I was so impressed w/ her organization. I just didn't think I could do it. But you broke it down into baby steps, so this summer (if the custodians will let me in my room!!!) I'm gong to Binderize! Thanks for sharing your creativity! I particularly like the book boxes!!! Thank you so much. The closest I came to getting organized is when I went through my file cabinet drawers and threw out duplicates and outdated materials. I thank you so much for creating these and helping me get started on organizing myself. You have inspired me to go back to binders! When I first started teaching, I had all my materials in organized binders (ie: one for each novel, poetry etc.). Then a teacher I co-taught with strongly suggested I switch to files because it would be much easier. I could never really fully make the transition, so I still have my binders (although they have been unused) and I have been struggling for three years to make the file folders work. Your blog has inspired me to ditch the file folders and return to my binders. And I'm hoping your labels will make them look great! I am a new follower...very happy to have found you! I do not have a blog, but I am following your TN store! This is awesome! I LOVE doing binders! It is an expensive way to start, but once you have them, the organization lasts for a life time! My original binders are 8 years old & I'm so excited to get new ones & use your inserts for added organization. OCD comes with the territory! :) Thanks for sharing! I started putting things into binders when I found TPT...I have used book boxes for themed books, but I love the labels that you made to keep everything organized! Thank you for your pictures! I am on my way to binderizing a few of my themes. I have a feeling I will make the complete transfer before next year! THIS IS FANTASTIC! I have been thinking I want to do this and I just stumble upon this! THANK YOU!!!!!!!! Thank you! I have been teaching 3 years and still am looking for a good way to organize my files. I LOVE this and cannot wait to organize my classroom! Came across your blog, trying to find ideas for my kids for this summer... Love how organized you are! It looks great! Wow! That looks great! I'm so impressed. Thanks so much for sharing. Thank you for sharing! It looks like you separate the holidays from curriculum in the binders...what are your thoughts on putting it all together & just doing monthly binders? Thank you so much for this!!! I can't wait to tackle this during the summer! I don't know how you got it done during the year!! You are so welcome! Denae, I have some friends who organize everything in monthly binders and love it! I tend to move things around during the year (we get science kits rotated at different times each year) so that is why I did not do my binders that way. I just don't want to have to reorganize them every time we get a new math series that teaches topics in a different order. I think it is totally up to your personal preference, though! ThANK YOU! You have given me hope. I have been trying to come up with a system to organize all my ----. i am so close to tossing it all and starting over; then I think ---of all the time put into collecting all my stuff. I love your organization! I am the same way but I can't wait to add the covers to my binders! Where did you get all of the borders you use for your covers? I would love to use them for other things in my classroom! I saw on your TPT profile that you teach 1st grade in Smyrna -- me too! Small world. :) Hope your year is ending well! Love your organization. How long did it take you to complete one binder? Thanks, Nina! Tricky question...I worked on actually getting things into the binders/sheet protectors for few days, but the whole project has been pretty spread out since I just don't have a lot of time:). Initially, I spent about 4 hours on my curriculum binders and probably about the same amount of time on my monthly binders. I was really weeding stuff out, though, so I looked/debated about everything I kept or threw out. I didn't get the fancy labels onto the binders until a couple weeks later...I just worked on those a few binders at a time and they went pretty quickly since I already had sticky notes labeling what I wanted the tabs to be. I just recently finished all of my teacher resource binders and haven't shared those on the blog yet. They took another afternoon, plus a few random hours of labeling. Really, I've just tried to do little bits as I can since we're pretty busy with our toddler and having our house for sale. Now that all my files are done, I'm slooowwwwllyy starting on my supply tubs...Hopefully I can share some things for those soon! Hello! I am just beginning my process of binderizing since I'm moving schools at the end of the year and am using your labels! I am very excited! I teach at a Catholic school and was wondering if you could send me a PDF of one that says Religion in the Red background with the matching spine. Thanks! Thank you! My plan is to do this for all my papers this summer. Hopefully, it will turn out! I liked how you used your chair on wheels to facilitate this project! WOW! I am ending my first year teaching second grade and I feel totally overwhelmed. I am now energized to tackle my files this summer! WOW!! I just stumbled across your blog from Pinterest and I am sooo glad I did! This looks amazing! I was planning on doing this exact same thing this summer and I was looking for some help... and here you are! Thank you so much for sharing your great resource! I just started a little project by organizing my manipulatives and I made these cute little lables for them! Hopefully I'll be posting it soon and sharing those labels. Check my blog in the near future!! And of course, now I'm a follower! Stumbled on your blog from Pinterest...love the Binders! I can't wait to begin! This is an incredible idea! Files drive me insane because of how messy they can become. I create binders of students work, but never considered binder-izing myself. This is awesome! Thank you for your idea! What program do you use in order to create the binder covers? I like the borders and images! I'm glad you like them! I use PowerPoint to create everything I do. I use borders/frames purchased from PrintCandee, Scrappindoodles, KPMDoodles on Etsy, and the clipart is Thistlegirl Designs. Please check how I used it on my blog!! This is perfect!! I just finished organizing all my math materials and books and was looking for a way to do the rest of my things. Awesome! Thanks! I'm wondering what you keep in your file cabinet now?? I am just starting out in my first year of teaching. Thanks for the great organizing tips! I think I will START this way, so I don't have to ever re-do my files!! Color coding and binders? You're speaking my language! These are beautiful! I can't seem to get the binder spines to slide in the binder pocket....is there a secret? I was very exited to see how you organize your binders. I tried to download the files and was unable to do so. I kept getting the message that they didn't exist. What am I doing wrong? Loved your work and tried to find it on TPT. I found the customized covers, but not your freebies offered here. Have you removed them? Thanks in advance for a reply. I will keep checking back. Love them! I would like to know the font used on the binder labels. BTW, I too love Thistle girl designs? HI! I LOVE your binders and went and bought 25 1" binders, printed the spines on colored cardstock and went to insert them and it ended up bunching and crunching up and not letting me insert. :( Am I doing something wrong? Did I spend $50 on binders I cant use? Please advise. Kate, I'm so sorry you had trouble! I've found that not all 1" inch binders have exactly the same size spines as well--Although I am sorry you had the find out the hard way, too! To fix that same problem with some of my mismatch binders, all I had to do was trim my spines on both edges so that the font was still centered. Are you able to do this? Sorry for your trouble, and good luck! This is a great idea. I am a new teacher, yet to have my own room. I am currently substituting. I have many resources I have been collecting while in college and during internships. I was thinking of putting them in binders so that I will be prepared for when I do have a class. How would you recommend organizing the materials. They range from 2nd grade to 5th grade. I have curriculum books (non school board related, but good ideas), worksheets, bag of tricks list, activity ideas, etc. Any ideas? Hooray to 100 followers and boo to some bad news!